Writer Brian Azzarello brings his gritty, nuanced storytelling to these two unforgettable characters. COMEDIAN, featuring art by J.G. Jones (FINAL CRISIS, Wanted), plants the famed war hero within the context of modern American history, as we discover the role he played in the Vietnam War and the Kennedy assassination. 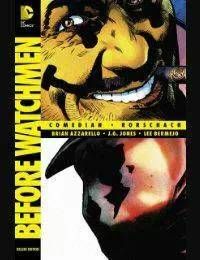 In RORSCHACH, Azzarello teams with artist Lee Bermejo (JOKER, LUTHOR) to show how one of most dangerous vigilantes the comics world has ever seen became even darker. Collects BEFORE WATCHMEN: COMEDIAN #1-6 and BEFORE WATCHMEN: RORSCHACH #1-4.